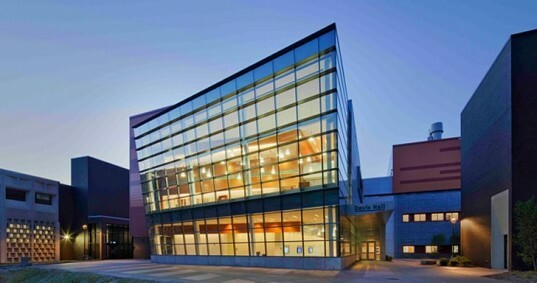 Since 1923, the University at Buffalo School of Management has built an impressive reputation as one of the best schools of business in the world. The comprehensive range of our academic portfolio, the expertise of our faculty and the worldwide success of our graduates are the primary reasons for the school’s acclaim. The UB School of Management is recognized for its emphasis on real-world learning, community and economic impact, and the global perspective of its faculty, students and alumni. For more information about the UB School of Management, visit mgt.buffalo.edu. In 2007, SUNY University at Buffalo reduced [its] MBA class size by almost a third, limiting enrollment to 100 and imposing more stringent admissions standards on the incoming class. There are no minimum GMAT score requirements for entry into UB's MBA program; a student's full background is considered when making an admission's decision. LeaderCORE™ What is at the core of every great leader? That's what the University at Buffalo School of Management has been asking corporate recruiters for decades. We know that corporate leaders want business school graduates with skills beyond industry knowledge and technical ability. that spans the entire two years of our MBA program. Through LeaderCORE, you will navigate real-world business situations while developing a set of clearly identified management competencies that lead to effective performance in the workplace. The UB MBA Experience and Curriculum UB MBAs are active, innovative and collaborative. Our students are unique individuals who bring different perspectives, experience and skills to the program. This diversity of people, ideas and backgrounds will prepare you to move into an ever-changing global business environment. The MBA experience begins before you ever set foot in the classroom. During our inventive orientation and professional development sessions, known as MBA Advantage, you will become acquainted with classmates, complete initial competency assessments and work with the Career Resource Center to develop your job-search strategy. Unlike orientations at other business schools, MBA Advantage does not end after the first few days on campus. Each semester of the program begins with informative and interactive professional development seminars. At UB, career planning begins—quite literally—before you even step on campus. As a requirement of graduation, all students must complete MBA Advantage, a comprehen­sive professional development program in August before your first year (with addition­al sessions in January and September). In addition to MBA Advantage, the Frank L. Ciminelli Family Career Resource Center (CRC) helps students prepare for the job hunt through career development workshops, practice interviews, career advising and more. The CRC also hosts various networking and recruiting events to link current students with local employers and alumni. UB is “very well-known in Western New York,” and students benefit from the school’s “great reputation and strong regional recruiting” pro­gram. For those who plan to stay in the area, UB has a “strong alumni network, especial­ly locally.” In recent years, MBA graduates report an average base salary of more than $58,000, with a range between $16,500 and $100,000. Eighty-two percent of students were employed within three months of graduation. More than half the class took positions in Western New York, with another 8 percent landing jobs in downstate New York. Over the past few years, the top employers of MBA graduates have included M&T Bank, Citigroup, Deloitte & Touche, Toys R Us, IBM, Fisher-Price, Rich Products, PriceWaterhouseCoopers, Ernst & Young, New Era Cap, and Xerox. "UB MBA graduates are seen as extremely bright, eager to succeed and good investments - an irresistible combination for corporate recruiters seeking top business talent. "Arjang Assad, DeanUniversity at Buffalo School of ManagementUB MBA DistinctionThe reputation of the UB School of Management spans the globe thanks to its academic excellence and affordability. The key attributes of our program -- real-world learning, community and economic impact, and the global nature of our programs -- give our graduates a competitive edge, positioning you for success in the world of business. LeaderCORE ™What is at the core of every great leader? That's what the University at Buffalo School of Management has been asking corporate recruiters for decades. We know that corporate leaders want business school graduates with skills beyond industry knowledge and technical ability.As part of our real-world learning initiative and to ensure that our graduates are "management ready" and can create value for their organizations, we've developed a comprehensive leadership certification program called LeaderCORE that spans the entire two years of our MBA program. Through LeaderCORE, you will navigate real-world business situations while developing a set of clearly identified management competencies that lead to effective performance in the workplace.The UB MBA Experience and CurriculumUB MBAs are active, innovative and collaborative. Our students are unique individuals who bring different perspectives, experience and skills to the program. This diversity of people, ideas and backgrounds will prepare you to move into an ever-changing global business environment.The MBA experience begins before you ever set foot in the classroom. During our inventive orientation and professional development sessions, known as MBA Advantage, you will become acquainted with classmates, complete initial competency assessments and work with the Career Resource Center to develop your job-search strategy. Unlike orientations at other business schools, MBA Advantage does not end after the first few days on campus. Each semester of the program begins with informative and interactive professional development seminars.The UB MBA program is small and selective offering you a highly personalized experience. In every sense of the word, you will be part of our community. Our emphasis on team-based learning connects you with other students in the classroom and beyond, as you work in the same kind of team environment that exists in most top business organizations today.For the first year, your team will be paired with a Corporate Champion, providing you with a unique opportunity to become more involved in business and the community while gaining real-world perspective on classroom theory. Corporate Champions work with students on a series of activities including MBA Advantage, a Learning Lab Experience, a company site visit, a community service activity and an end-of-semester networking reception.You'll also hone your problem-solving and analytical skills by participating in a variety of case competitions. The nature and variety of cases will require you to draw upon a range of expertise and skills and integrate what you’ve learned across functional areas, enabling you to propose solutions and present recommendations.Draw from the Experience of OthersMBA ambassadors assist with recruiting efforts by taking prospective students out for lunch, leading campus tours and calling prospective students throughout the admissions process. Our second-year mentors offer support, feedback and practical advice, helping you transition from the role of an individual contributor to a fully functioning team member or leader.The University at Buffalo School of Management is known for its network of industry leaders, distinguished faculty and prominent alumni. Our Executive Speaker Series features speakers from this network who have excelled in their business careers. The series will give you the opportunity to meet today's executives and learn from their rich experience.The Bottom LineYou will graduate from our program with valuable tools for success, including the following:- A breadth of knowledge across all function areas- Comprehensive, in-depth knowledge in one or more specialized areas- Highly developed analytical and conceptual skills- Practical, hands-on business experience- The ability to think strategically and solve problems- Strong interpersonal and teamwork skills- A global perspective and understanding- Polished communication and presentation skillsCareer Development/ManagementThe School of Management has its own Career Resource Center (CRC) dedicated to connecting talented students and top employers. The CRC staff will find ways to make education and real-world learning pay off in business. From your first day, the CRC will work with you to help you develop your career strategy and hone the tools needed for an effective job search and a successful career. The CRC offers you a variety of seminars to learn how to leverage skills, create a personal brand, use social media in the job search, and successfully build a network of contacts.Student Testimonials"Often, soft skills and competencies are regarded as qualitative, but with LeaderCORE, I developed the tools to define and measure those competencies. This is critical in the real world. UB MBAs derive significant value from this program, and the impact can be experience in the workplace. "Harshit Purwar '12Sourcing Manager, Praxair"The Corporate Champions really opened their doors to us and were very receptive. Everything in the program tied in so well together. It was great to apply what we were learning to real-life situations. "Jill Pitzonka '10Assistant Project Manager, Erie Canal Harbor Development Corporation"From intriguing lectures and challenging case studies, to the countless team-based projects with students from across the globe, the school's focus on preparing students for success in the real world was evident. The strong foundation, touching on all aspects of business management, that was built during my two years in the MBA program continues to help me progress in my career. "Timothy Silverstein '08Director of Investor Relations, National Fuel Gas Co.
MBA - Full time - 2 year; MS Accounting - 1 year w/UG Acct degree from U.S.; MS Management Information Systems - 1 year; MS Supply Chains & Operations Management - 1 year; MS Finance - 1.5 years, financial management or quantitative finance tracks; Two semester exchange program with Renmin University in Bejing, China. Awards MBA degree from both institutions and provides for summer internship. The Alfiero Center, opened in April 2005, features an Internet cafÃ©, high-tech classrooms, an entrepreneurship suite, and dedicated space for student clubs, meetings and group projects. Wireless computer technologies are integrated throughout the building, giving management students around-the-clock access to business research and market data. The Career Resource Center offers career-related workshops specifically focused on International MBA students including navigating the U.S. job search, visa concerns, networking and job search strategies. http://mgt.buffalo.edu/career/students/prep/registration/workshops/preparation. The Graduate Programs Office also hosts an International MBA Advantage day prior to classes. This includes cultural simulation exercises and insight into the US classroom. Tutors identified for students as needed - pay for service basis. Teaching Assistants available for all core and some elective courses. Study Abroad is available in a number of countries through the university's international programs office but not generally encouraged at graduate level. Millard S. Drexler - Chairman and CEO, J.Crew Group, Inc.
Want more info about University at Buffalo, School of Management Executive MBA? Get free advice from education experts and Noodle community members.